The city is considering whether to require that dogs be on a leash at the popular wooded park in Portland. Libby Marcus and her husband, Davis Robinson, are self-described animal lovers, former dog owners and regular walkers at Mayor Baxter Woods in Portland. So when a muddy-pawed standard white poodle came bounding up to Marcus on Sunday morning as she walked through the popular wooded park, she opened her arms wide in welcome. 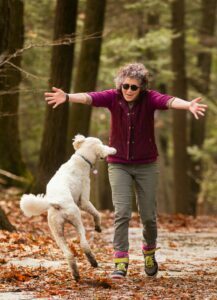 Libby Marcus of Portland greets an enthusiastic 3-year-old standard poodle, Archie, in Portland’s Baxter Woods on Sunday. Archie, who was there with his owner, Charles Melcher of Portland, was enjoying the morning in the park leashless, which may not be possible if a city ban on loose dogs is passed. “The dog owners have very few places to let their dogs run,” said Marcus, of Portland. 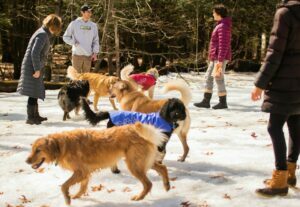 Marcus said she is definitely on the side of dog owners in the recurring conflict over dogs’ access to public parks and beaches in Maine. Skirmishes have broken out in recent years at Pine Point Beach in Scarborough and Willard Beach in South Portland. Now the Portland Parks Commission is considering adopting a leash law at the 32-acre Baxter Woods, the largest undisturbed forest in Portland. Complaints about dogs at Baxter Woods are not new. In 2014 the city cracked down, posting signs and holding a meeting to warn dog owners to be respectful of others. Citing continuing complaints from the public about unruly dogs, the Department of Parks, Recreation and Facilities has proposed requiring that dogs be leashed on a 25-foot lead at all times. The parks commission will take up the matter at a meeting at 5 p.m. Thursday at Portland City Hall and is scheduled to vote whether to send the leash proposal to the Portland City Council for action. Ethan Hipple, deputy director of the parks department, cited other reasons in support of a leash requirement in a letter to the parks commission. He wrote that the woods were deeded to the city in 1946 by Gov. Percival Baxter with conditions that they be retained in trust for the benefit of the people of Portland “as a municipal forest and park and for public recreational and educational purposes” and “shall forever be kept” in a “natural wild state” and as a sanctuary for wild birds. Hipple pointed to a 2018 report by forest ecologist Rob Ryan that found that off-leash dog activity was having a negative impact on ground-nesting and ground-feeding birds. He concluded the woods would not qualify as a sanctuary for wild birds in their current use. Hipple noted that there are other nearby spaces where dogs are allowed off leash, such as the Evergreen and Canco woods and the Quarry Run. Hipple’s department has a collection of emails from residents with safety concerns about unleashed dogs in the woods, including a Lincoln Middle School science teacher who wrote that a number of students on a recent nature walk in the woods were terrified by the dogs they encountered. Chelsea Malacara – a Deering Center resident, member of the parks commission and dog owner – wrote that she never walks her dog at Baxter because of unruly, ill-behaved off-leash canines. She recounted a recent walk while pregnant in the woods without her dog and wrote that she was nearly knocked over by a dog, whose owner was not apologetic. Some of the dog owners at Baxter Woods on Sunday, all of them Portland residents, were overwhelmingly against the idea of leashes. They said there are better ways to protect birds, such as protective fencing, signs or requiring leashes during nesting season only. They pointed out that the woods are filled with raccoons, skunks, foxes, hawks, owls and other predators that are a threat to ground birds. Dog owners and their canine companions commune on Sunday in Portland’s Baxter Woods. Dogs are currently allowed to be off leash in the park, though will not be if a city ban being considered on loose dogs is passed. From the left are Amy Homans, Rocco Spizuoco and Jane Wellehan, all of Portland. Charles Melcher walks the woods daily with his 3-year-old white standard poodle, Archie. He said banning off-leash dogs would threaten a way of life for the dog walking community. “There is a whole community of people and dogs, a great community. There are discussions about politics and the weather,” said Melcher, who plans to be at Thursday’s meeting. Amy Homans said her daily walk with her Austrian shepherd, Babe, 5, is her only exercise apart from walking to her car and to the printer at work. She said she has a group of friends who walk their dogs together when it gets dark early. Homans compared her walks with her dog in the woods to a religious experience. “This is Our Lady of Baxter Woods. This is the only community I have. I don’t go to church. I don’t go to PTO anymore,” Homans said. Jane Wellehan walks her two labradoodles, Obie, 12, and Riley, 10, in the woods. She said when she was growing up the woods were not safe. There were lots of people doing drugs and camping out. It was a popular spot to dump old stoves and tires, she said. “It’s a beautiful place now because there are so many people walking their dogs,” Wellehan said.